For months, Jin of Seeking Food and I had been trying to meet up, but couldn't get together until Memorial Day. Of course that meant I had to barbecue. Well, I didn't have to barbecue, but no Memorial Day is complete without one! I found a one pound chunk of pork shoulder in my freezer, leftover from when I made Thit Heo Kho Cu Cai Trang Cu Sen (Vietnamese Braised Pork with Daikon and Lotus Roots. 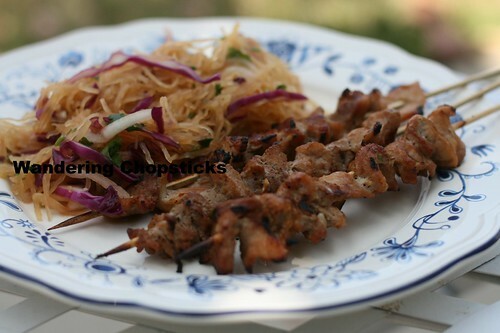 The pork made me think about reshooting my Bun Thit Heo Nuong (Vietnamese Rice Vermicelli Noodles with Grilled Pork) recipe long ago. Even though I said grilled in the initial recipe, I didn't have one at the time and just cooked it in my kitchen. Jin was eating low-carb though so the rice vermicelli noodles were out. 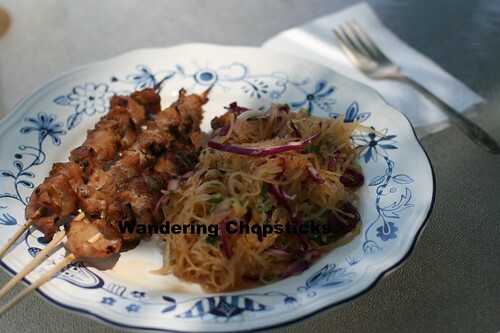 I had spaghetti squash on hand, but instead of making a rice noodle bowl with spaghetti squash, which would have been a good idea actually, I made Goi Bi Soi Chay (Vietnamese Vegetarian Spaghetti Squash Salad) to serve on the side since I was pairing it with pork skewers. She liked the Vietnamese spaghetti squash salad so much that I sent her home with some. 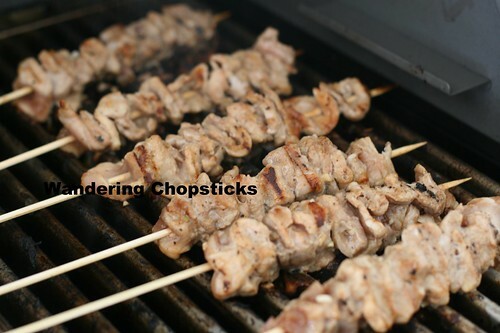 As for the pork skewers, I was only making lunch for two, so you can easily double or quadruple the recipe if you're making them for a party. 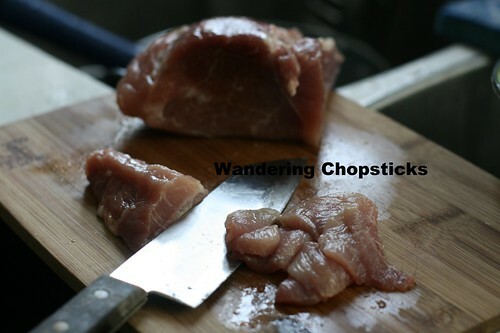 Slice the pork thinly into 1-inch by 2-inch pieces. In a shallow bowl, combine 2 tsps fish sauce, 2 tsp soy sauce, 2 tsp rice wine vinegar, 1 tsp salt, 1 tsp sugar, 1 tsp ground black pepper, 1 tblsp olive oil, minced shallots, and minced garlic. 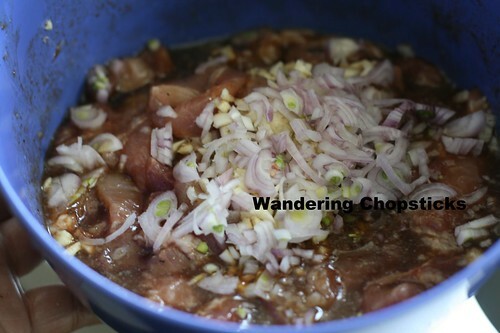 Slather the marinade on the pork and set aside in the fridge for about an hour or longer if you wish. 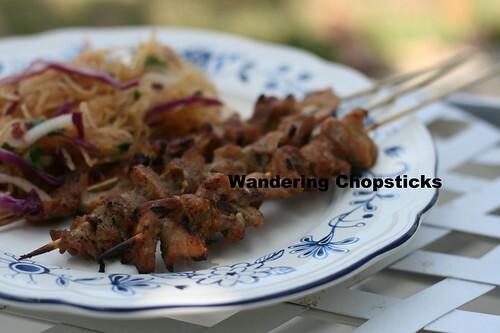 Soak about 6 to 8 bamboo skewers in water to prevent burning on the grill. 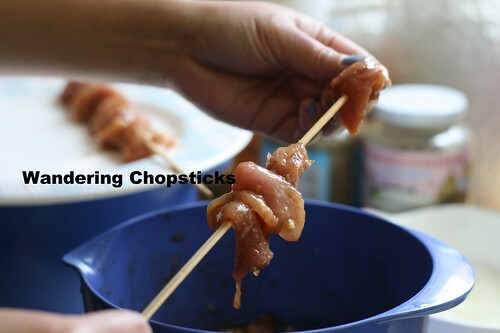 When you're ready to cook, put the pork on the skewers as demonstrated by Jin's lovely hands. Try to spread out the meat a little so it's not clumped up and will cook more quickly. Look how I make my guests work for their supper. I was busy making the spaghetti squash salad, OK? Fire up your grill and cook the pork skewers. 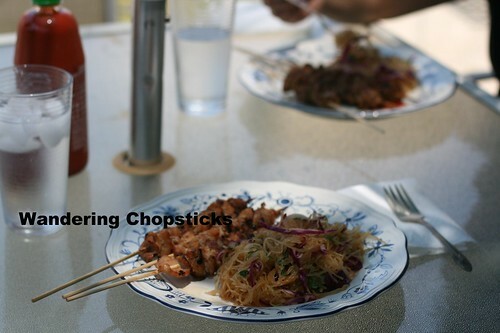 You can serve the skewers with rice, rice noodles, or spaghetti squash, as I did. Serve with Nuoc Mam Cham (Vietnamese Fish Dipping Sauce) if you do, or with a healthy dose of Huy Fong Foods, Inc. Sriracha like I did. Nothing beats dining al fresco under sun-dappled shade in the backyard. While catching up with a friend. 3 years ago today, Xa Lach Thit Bo (Vietnamese Steak Salad). 4 years ago today, Portland from Glendora rose. 5 years ago today, Sup Mang Tay Cua (Vietnamese Asparagus and Crab Soup). 6 years ago today, Mandarin Noodle Deli - Temple City (Closed). Hi, Do you have the recipe for Goi Bi Soi Chay? 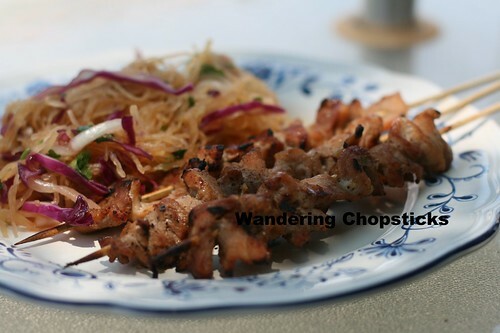 It looks so good with the grilled pork!